This was the Budget when Brexit came home to bite. Growth forecasts downgraded for the next three years underlined the scale of the challenge facing the Tories – and the opportunity for Labour to press home its own argument on the economy. This was also the Budget when the government’s own record showed more signs of catching up with it – or should we say the record of the Cameron/Osborne axis, because their successors have done so little. Many of key points – £3bn more for Brexit preparations; retaining the public sector pay cap; only tiny measures to alleviate the sufferings caused by universal credit; and nothing on social care – simply showed where this country is going wrong. The falling forecasts for productivity are a sign of the Tories’ failure to rebalance the economy, even as there is an immense challenge for Labour in trying to make political gains from the dry subject of output per hour. The backdrop for Jeremy Corbyn was tough – or challenging, as economist like to say – when he stood to deliver his response to the chancellor’s statement. He painted a picture, as he has done so often at prime minister’s questions, of Britain falling apart at the seams. A nation in which the young are burdened with debt and the elderly are starved of the cash necessary for social care while the rich grow ever richer as we slide towards the status of “tin pot tax haven”. Corbyn initially admitted that Philip Hammond had coughed up some decent proposals – while Theresa May had waved a pack of Strepsils as part of some pre-arranged joshing in homage to her conference speech meltdown in Manchester. The Labour leader’s speech was shorter than that of the chancellor, which is how it normally works, but he will have been boosted by the sight of several announcements that were eerily familiar to him. “The Conservative manifesto has now been shredded and some ministers opposite have since put forward some half-decent proposals, several conspicuously borrowed from the Labour manifesto”, he said, before adding a decent payoff. This tackled the traditional difficulty for the leader of the opposition when the government pinches your ideas – claim vindication and victory or condemn them as not going far enough. In veering towards the first of the two and, in pointing out the origins of several proposals – such as a review to look punishments for property developers who hoard land – he struck the right tone. Meanwhile, somewhere in Westminster, Ed Miliband – whose policies to clampdown on the very issue of land banking with “use it or lose it” laws had been condemned by the Tories as a “Venezuela-style land grab” – was no doubt smiling ruefully. This is, however, one of the toughest days of the year for someone who commands a party outside government. Corbyn likes to get fired up to rail against social injustices – and there are so many of them after seven years of spending cuts – but the start of his speech was met with Tory MPs streaming out of the Commons chamber. Then, as he tried to raise the care crisis, citing figures showing that “over £6bn will have been cut from social care budgets by March next year”, he faced a concerted effort by Tories to drown him out. 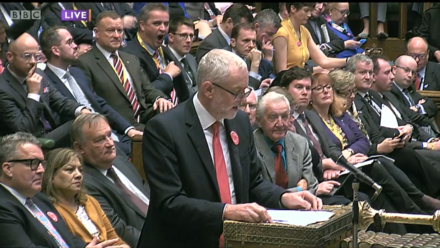 Junior MPs sat in the aisle next to government benches and tried to throw Corbyn off his stride as he set out the impact of austerity on the elderly, prompting the fury of MPs such as Ronnie Campbell and Dan Carden. Corbyn stuck to his task and used his PMQs tactic of weaving in stories from voters who had been in touch with him. He tried to summon a sense of anger to power his way to a big finish – and, of course, to provide the broadcasters of the clips they necessary to show him and Hammond on the evening news. Yes, it was tough with a half-empty Commons chamber and the continuing Tory jeers but Corbyn found the words for a finale that seemed to please most of his colleagues behind him. “Our country is marked by growing inequality and injustice,” he said. Corbyn got his message across on a testing day for any opposition leader. The Labour benches cheered him as he stood down. There is no point trying to score Corbyn versus Hammond on Budget Day. The chancellor will always command the headlines whether he has pulled a rabbit out of the hat or merely a dead duck. The reality, however, is that the Tory announcements offered little for anyone who is out of work, stuck on low pay, burdened by student debt, old and infirm, or worried about how their business will cope after Brexit. Corbyn’s argument still stands and the suspicion remains that he will be around for far longer than Hammond. This Budget sketch today replaces the normal PMQs’ verdict piece.